The code in this gist isn't as succinct as I'd like it to be. Please bare with me and ask plenty of questions that you may have about it. I can make one HTTP POST/GET before an error is thrown. Code unedited. Why don't you use PEP8 (at least 4 space indentation) and don't write Python 3 compatible code (print as function)? @lq08025107 that should probably be at the top of the GET /blocks route, shouldn't it? The peer_nodes is an empty list... how does it get populated? i'm working on a reimplementation of aunyks's great work. feel free to check out my repo simple_blockchain. it's far from perfect right now... would love some criticism or help! i plan to implement some of the features core to the original blockchain system, outlined in the bitcoin whitepaper. so far, i've included the nonce calculation and hashing, with a variable for difficulty. i still need to work on transaction broadcasting to other nodes, transaction verification, etc. However, it seems you can avoid doing the work by just multiplying the last proof by 9.
so how is the peer_nodes populated and how do we make use of the consensus function? Is there like a central authority that takes care of peer_nodes? that seems like overkill for a small POC like this. I am currently work on a port of this to Groovy using the Spark web server. Most of the code is ported and should be fully functional shortly. Hey @aunyks don't leave use wondering how this fantastic tutorial continues and how wallets work. Thanks again and keep it up! The consensus function synchronizes the blockchain of the current node to the longest blockchain available across the network of peers. It should be called in '/blocks' before populating the list of blocks to be returned, thus the node makes sure its blockchain is the same as all the other peers. If I host the above source on my machine and you host it on your machine, will this still be like we are using the same blockchain to mine SnakeCoin? Or is there a way that nodes have to be connected before you start mining? How do we ensure that there is a limit on number of coins that can be mined? How can we increase the level of difficulty of mining as the number of coins mined gets increased? @saint1729 this implementation doesn't cover transaction broadcasting, which would allow other nodes to mine the same transactions. additionally, a coin issuance hard cap isn't covered here. increasing the difficulty of the mining just means increasing the difficulty of the proof of work algorithm. this implementation doesn't include a viable proof of work algo. @drewrice2 I see. I found a good visual explanation here below. Are there any similar full fledged basic .java or .py implementations? TypeError: Unicode-objects must be encoded before hashing. ? @drewrice2 is there a possible solution to perform transactions between two computers with the above code? If not how can we make transactions over a network? Please let me know. 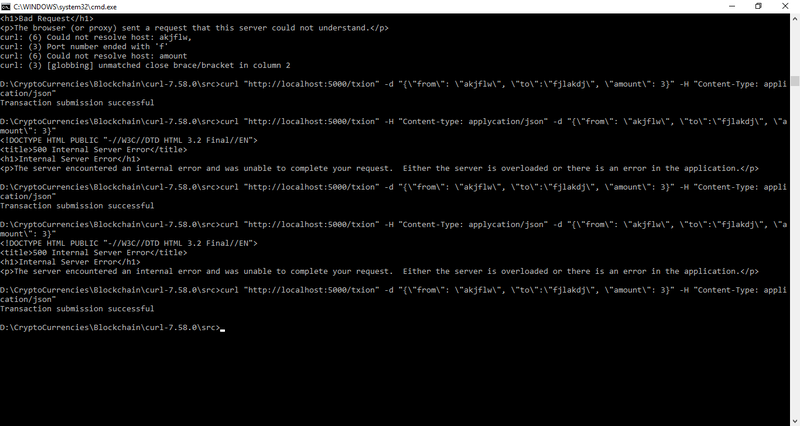 I am able to run the localhost:5000/blocks and locakhost:5000/mine but the curl command doesn't work - I have everything set up on a windows machine. The method is not allowed for the requested URL. Where is the next_block function mentioned in part 1? is it replaced with mining? When you run the command "curl localhost:5000/mine", the new block will be added. In this code, the function "mine" in charge the adding new block. @DarkNTNT84 thanks, I will actually not have to implement mining, which is why I was looking for the next block function. Thank you! This code doesn't broadcast transactions to all nodes as mentioned in the bitcoin whitepaper, so each block would only contain the transactions for the user and miner of that node, instead of combining transactions from multiple nodes. /transaction should have a GET method which would supply other nodes will all the transactions this node has, which would then be added to this_node_transactions. To fix Internal Server Error aka "dict" object has no attribute "index", simply change chain_to_send = blockchain to chain_to_send = blockchain[:]. This will copy the blockchain array. So you wouldn't change the actual blockchain to JSON.